Home / Automotive / Spotted / Is This Half-Unmasked Mercedes-AMG CLA45 An RS3 Beater? Mercedes-AMG has let their latest CLA45 out with virtually no disguise – it's their answer to the Audi RS3. 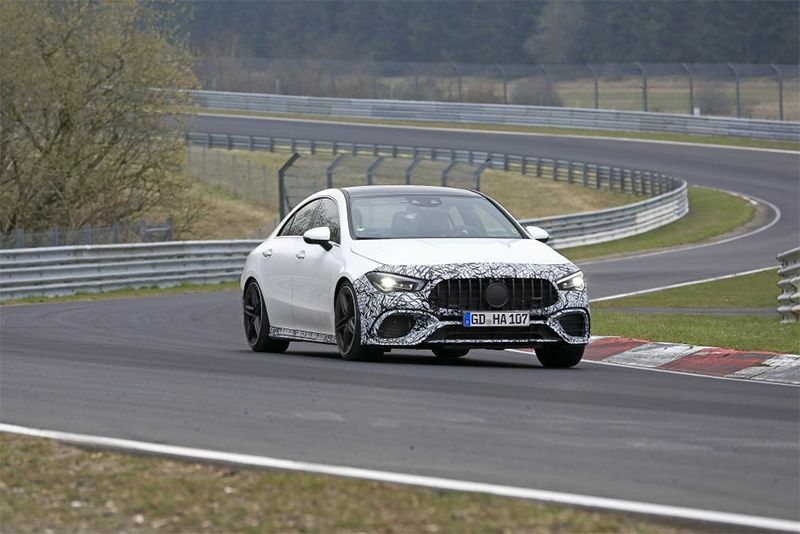 Spotted at the Nürburgring during calibration testing, the new range-topping Mercedes-AMG CLA45 has lost a large portion of its disguise and is almost ready to hit the showroom floors. Specifications have yet to be revealed but the rumour mill seems to think the 2-litre turbocharged four-cylinder engine will push around 416bhp through a 4Matic all-wheel drive. There's also talk of a "Focus RS-style torque vectoring rear axle" fitted underneath the sleek, long and wide body shell. Although there are splatterings of camouflage, the car in the images is most certainly the CLA45. Up front, the vertical grille slats and sleek LED headlamps in the new nose do a superb impersonation of big brother, the AMG GT63S four-door. Images of its bum reveal a stout rear diffuser wedged between pairs of twin exhaust pipes while a lip spoiler does duty on the boot lid. Until we see it in the flesh we can't be sure but this new CLA45 appears to be more comfortably proportioned than its predecessor with its longer bonnet and more shapely tail. This test mule looks to be riding on 19-inch wheels similar to those on the C63 S but we expect there to be one-inch smaller options too. Hop onboard and, besides all the latest tech already available to its current A-Class siblings, there will almost certainly be bucket seats, carbon fibre inlays and that AMGs chunky steering wheel. The official release date and pricing will be revealed later in the year and will likely be more than its predecessors £42k price-point for the CLA45, but there will also be the CLA35 and A35 saloon for those with shallower pockets.